So easy to use. Strong suction for quick installation, no tools required Universal Compatibility. Adjustable design fits almost all phones including iPhone, Samsung Galaxy, Note, Nexus, LG, and many GPS, the rubber pad clamp can protect your phone. 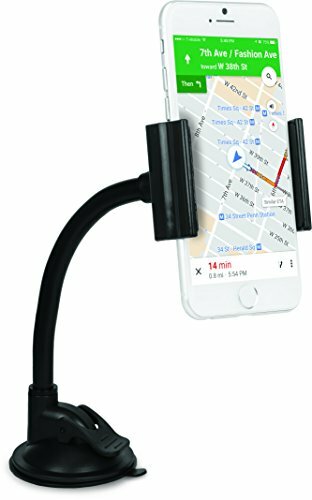 Full 360 degree rotation with joints for tilting phone in vertical or horizontal angles ADJUSTABLE: Fully adjustable 360 degree rotation so you can view your screen in portrait or landscape mode. The bendy gooseneck lets you position your device any way you want for your exact preferred viewing angles. Universal Compatibility. Adjustable design fits almost all phones including iPhone, Samsung Galaxy, Note, Nexus, LG, and many GPS, the rubber pad clamp can protect your phone. ADJUSTABLE: Fully adjustable 360 degree rotation so you can view your screen in portrait or landscape mode.